When I first heard mention of a cast iron skillet pizza I was intrigued. I normally use a regular pizza pan that looks like a jumbo size cake pan, and has to be at least 16" in diameter if not larger! I knew to accomplish this mission that I would need two things: A cast iron skillet and an amazing pizza dough. The cast iron skillet was a great buy at $15.99 for a 12" size. Next up the pizza dough. I knew I wanted a thick, chewy, and flavourful pizza dough. Most of the pizza dough I've previously made have been good, but lacking. I looked at the list of ingredients, and most if not all recipes call for basic ingredients: flour, yeast, sugar, water oil, salt, and cornmeal for dusting the bottom of the dough. In a mixing bowl combine the yeast, brown sugar, and water. Allow to stand until foamy and creamy about 5-10 minutes. If used a stand mixer, attach the dough hook. Turn mixer to the lowest setting and slowly add half of the flour 1/2 cup at a time. Once half of the flour has been added, add in the garlic salt and the softened butter. Continue adding in the remaining flour and mix until the dough has climbed up around the dough hook. If the dough seems too sticky add in 2 Tbsp flour. If the dough seems too dry add in 2 Tbsp water. Coat the inside of the cast iron skillet with the remaining 2 Tbsp grapeseed oil. Press dough into the bottom and up the sides of the skillet. 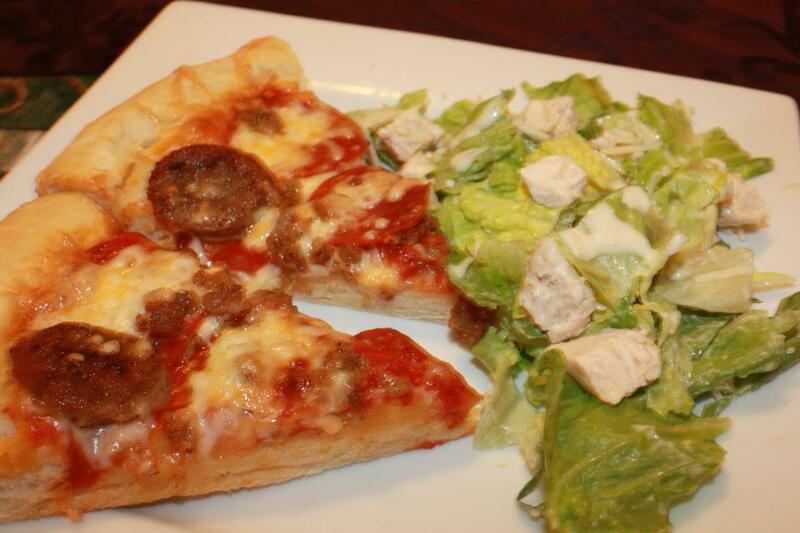 Spread tomato sauce, and your preferred toppings over the pizza. Bake on the bottom shelf for 25 minutes, or until the pizza is golden brown. Watch carefully to make sure it doesn't burn! For this pizza I used sliced pepperoni, cooked crumbled pork sausage, 1 italian sausage link cooked and cut diagonally, and mozzarella cheese. Mouth watering perfection! **Don't have a pizza stone but you prefer a personal size thin crust pizza? Problem solved. 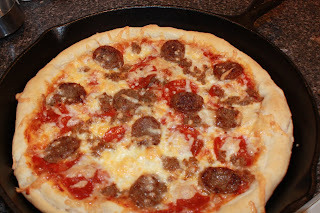 Flip a cast iron skillet over (preferrably one w/ a flat/smooth surface) and slide your pizza onto the bottom side and bake as you would using a pizza stone! ***I normally try to proof my dough at the edge of the counter when my dishwasher is running, draping the towel over the bowel and by the steam vent of the dishwasher provides an optimal environment for the dough to proof.